German Star Player With Turkish Roots Says He Quit National Team Over Racism Mesut Ozil was criticized after he posed for a photo in May with Turkish President Recep Tayyip Erdogan. "I am German when we win, but I am an immigrant when we lose," he said. 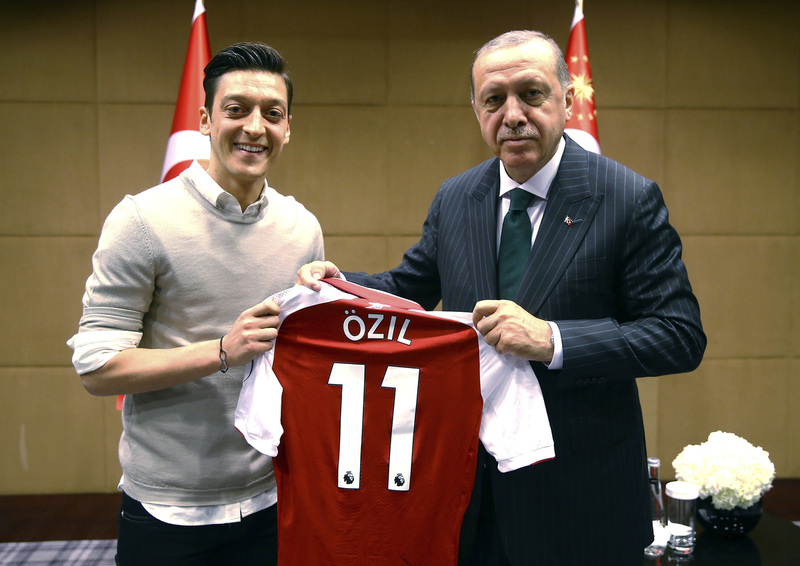 Mesut Ozil faced criticism after posing for a photo in May with Turkish President Recep Tayyip Erdogan. Ozil said that in the eyes of his detractors, "I am German when we win, but I am an immigrant when we lose." His family traces their roots to Turkey and he is proud of his background. "I have two hearts, one German and one Turkish." He said that after the infamous photo with Erdogan was picked up by German media, it caused a firestorm of criticism and racist language. Erdogan has been criticized by human rights advocates for his sweeping purge impacting tens of thousands of people after a failed coup attempt in 2016. Last month, Erdogan won a presidential election that expanded his powers. In his statement, Ozil said the photo taken at a London event "wasn't about politics or elections, it was about me respecting the highest office of my family's country." He said they spoke about soccer, and that he would have taken a picture with any Turkish leader. "I will no longer stand for being a scapegoat for his incompetence and inability to do his job properly," said Ozil, who also plays for Arsenal. "It is with a heavy heart and after much consideration that because of recent events, I will no longer be playing for Germany at international level whilst I have this feeling of racism and disrespect. I used to wear the German shirt with such pride and excitement, but now I don't." The German Football Association "rejected the charge of racism and said it would have been happy if Özil had remained a national team player," according to Deutsche Welle. German Chancellor Angela Merkel said through a spokesperson that she "respects" Ozil's decision and his accomplishments, the BBC reported. Other prominent politicians are calling for soul-searching. "I think everyone involved in this affair should look inward," German Foreign Minister Heiko Maas said, according to Deutsche Welle. "I see very few people who I would say have behaved well at all." On ESPN, writer Raphael Honigstein noted that "what's completely missing from Ozil's statement is any sense of regret or even acknowledgement that the meeting created an ill-timed, unwanted distraction for the entire Germany team a few days before they were due to head off to Russia." But Honigstein said that above all, this day is more painful than Germany's World Cup defeat: "The most technically gifted player of his generation feels he can no longer represent the white and black colours due to racism."